The new Iowa State University Land Value Survey released today shows a small drop in land values. 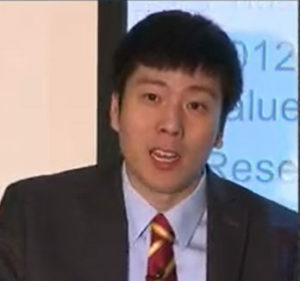 Iowa State University economist Wendong Zhang says values dropped just under one percent (.08). He says that puts the average value of an acre of land in the state at to $7,264. That’s $62 an acre less than last year’s survey. Zhang says farmland prices peaked in 2013 at $8.716 an acre. “For the last five years we have seen four declines — despite last year in 2017 there was a two percent increase — we have seen a steady decline off the peak,” Zhang says. Zhang says he has been asked repeatedly in the last five years if there is a concern about another collapse in values like we saw in the 1980’s. He says he is not concerned. Humboldt and Wright Counties reported the largest percentage decrease in value at 3.3%. Zhang says there has been a drop in farm income that’s led to the drop in land values brought on in part by big crops. He says we’ve seen the six and seventh largest crops in the last six or seven years and he says there’s also been a rebound in the beef and pork markets, as well as an increase in pork processing. Zhang says the cost of money is another issue driving land prices. “The second largest factor that people mention is a higher interest rate,” according to Zhang. “Over the last year, over the last three years actually, the Federal Reserve has been raising the interest rates.” He says the trade wars have also played some role. “The impacts of the tariffs on the economy is felt more by the agricultural states like Iowa,” Zhang explains. 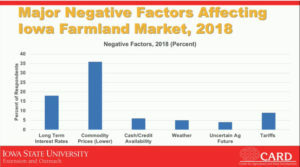 He expects land values to see another small dip next year — as he says new tariffs and other factors take some time before they are felt in land values. “Typically its an income decline last year that affects this year’s land values. 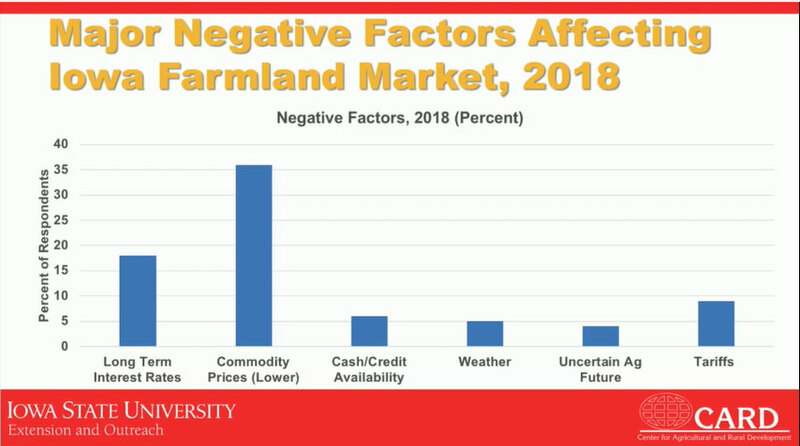 So it takes some time for the land markets to fully capitalize what’s happening in commodity prices…and the Federal Reserve interest rate hikes are a key factor in this,” Zhang says. Zhang says a trade deal with China could have some impact. “If you look at the commodity markets, just the sign that the two sides are talking gave a 50 cent bump in the commodity futures market,” Zhang says. He says that bump eventually went back down, but he says it shows the impact potential that is there. 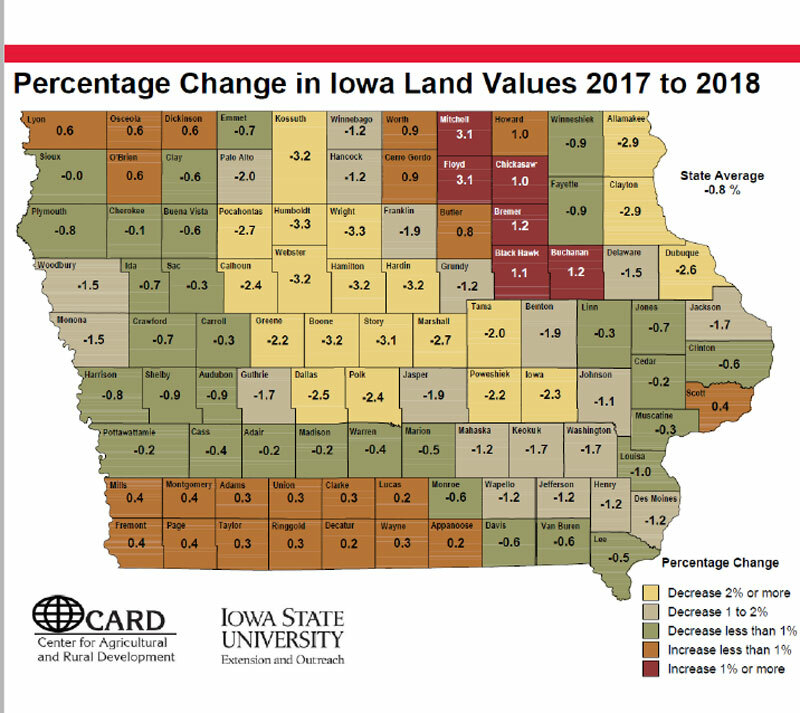 Scott and Decatur counties held onto the highest and lowest farmland value spots for the sixth straight year. Decatur County had a value of $3,488 an acre. That’s an increase of $8. Scott County reported a value of $10,537, which was an increase of $40 an acre. The south-central district reported the largest percentage increase of 3.8%. The central and southeast districts reported decreases of 2.4% and 3.6%, respectively. The northeast and southwest districts reported no notable change in value.